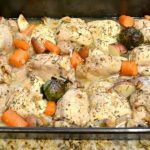 This Garlic & Herb Roasted Chicken and Vegetables dish is a hearty and savory dish that is easy to put together. The hours after school in our class are chaotic. Homework, sports, and music lessons leave little time for making elaborate dinners. I rely on my crockpot a lot, but I don’t like to use it every day because 1) I don’t always have the time in the morning to prepare the meal and 2) it gets boring having crockpot meals several days in a row. I’m always trying to find simple, healthy recipes with little prep time that I can have on the table by dinnertime. 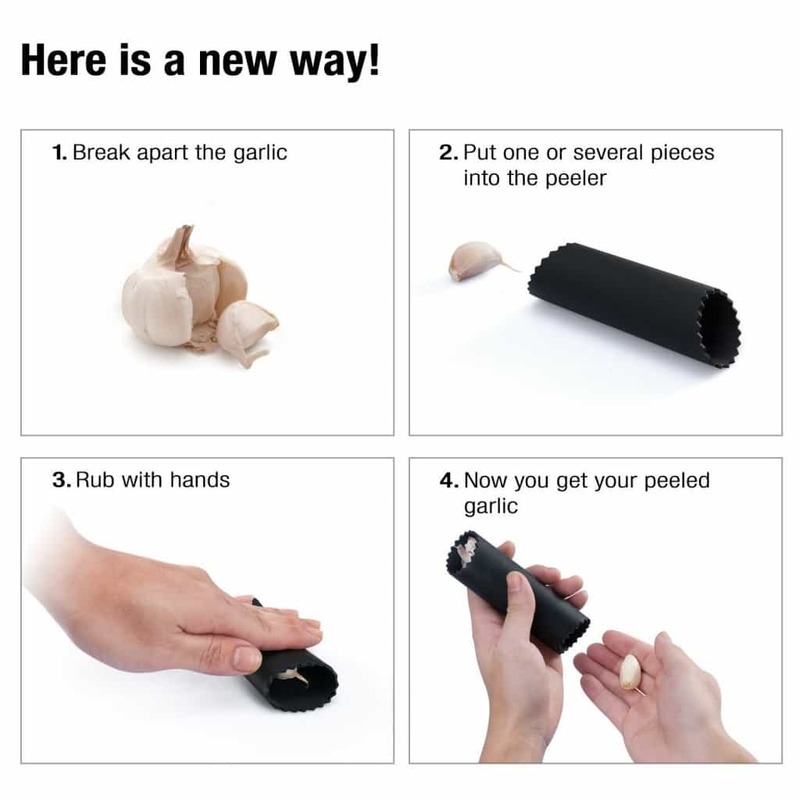 Excited over a new garlic peeler and garlic press I recently acquired, I decided to come up with a dish that featured this delicious bulb that is packed with health benefits. This Garlic & Herb Roasted Chicken and Vegetables dish is now one of my favorites! My husband likes to peel garlic by smashing it with a chef’s knife, which I’ll admit is efficient. But smashing it also breaks it open so you end up with garlic all over your fingers as you remove the peel. With the garlic peeler, you just insert the cloves into the tube and roll it gently with your palm. The skins separate from the garlic without smashing the garlic so you simply throw them away and put the undamaged cloves into the garlic press to mince. My family LOVES garlic, so I used an entire bulb in this recipe. That was lots of peeling and mincing and with my new handy tools, took only a couple of minutes. 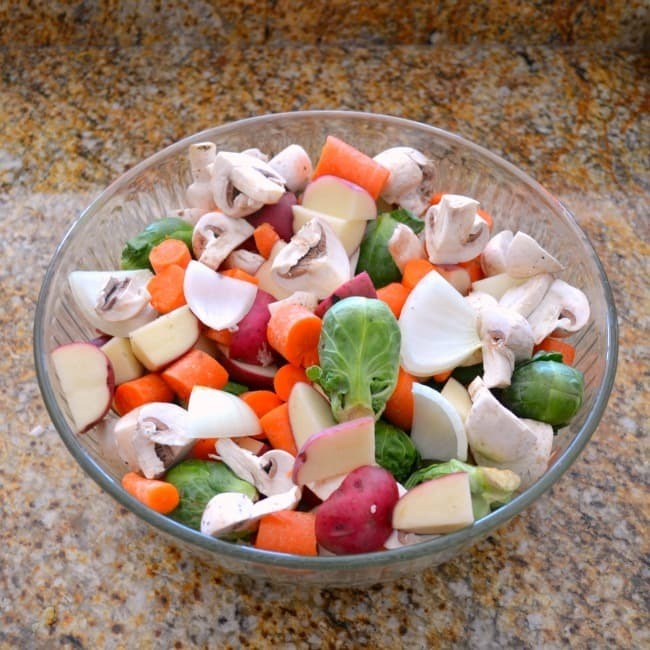 Next, I chopped up all of the vegetables and combined them in a bowl. 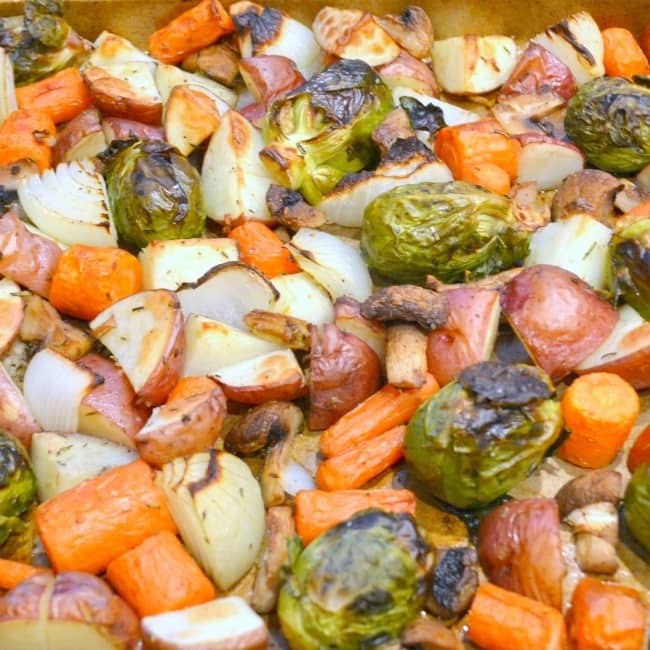 I used red potatoes, Brussel sprouts, carrots, onions, and mushrooms because that was what I had on hand, but you could substitute or add broccoli, cauliflower, and cherry tomatoes if you prefer. I love how pretty the combination of all the colors look! Next, I arranged my boneless, skinless chicken pieces in a roasting pan. I used both thighs and breasts so I made sure to nestle the breast pieces between the thighs to keep them from drying out. After the chicken pieces were arranged in the pan, I sprinkled them with salt and pepper. Then I added half of the minced garlic, thyme, and rosemary. In the small bowl where I had the minced garlic, I added the minced thyme and rosemary plus 1 teaspoon each of salt and pepper and 1/4 cup of extra virgin olive oil. I stirred the mixture to combine the ingredients and then poured it over the bowl of vegetables. Then, I used a large, wooden spoon to stir the vegetables until each piece was coated with the herb mixture. When the vegetables were well-coated, I poured them onto a large baking sheet in a single layer. I added a few of them to the roasting pan with the chicken for flavor. After that, I popped them both in the oven to bake at 400°F for 25 minutes, with the vegetables on the top rack and the chicken on the bottom rack. After 25 minutes, I switched the vegetables to the bottom and the chicken to the top (to let the chicken brown more) and baked them for an additional 5 minutes. They came out beautifully roasted (and the entire house smelled AMAZING!). 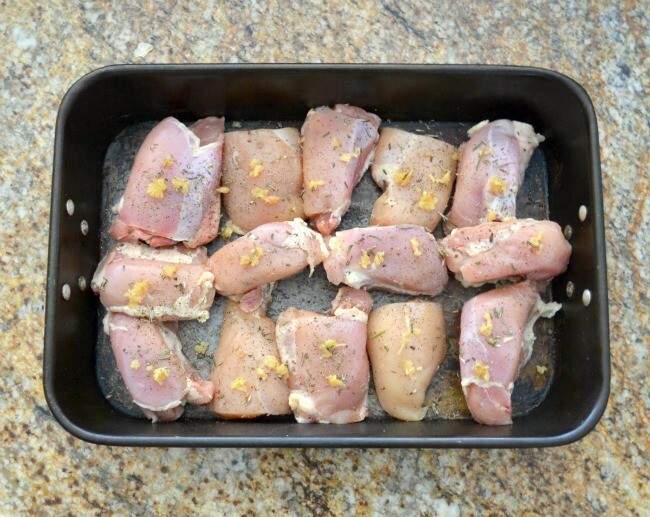 Arrange chicken pieces in a single layer in a roasting pan. Sprinkle with salt and pepper. Top with half of the garlic, thyme, and rosemary. In a small bowl, combine oil and remaining garlic, thyme, and rosemary, along with 1 teaspoon each of salt and pepper. In a large bowl, combine vegetables. Pour herb mixture over vegetables and stir until all pieces are coated. 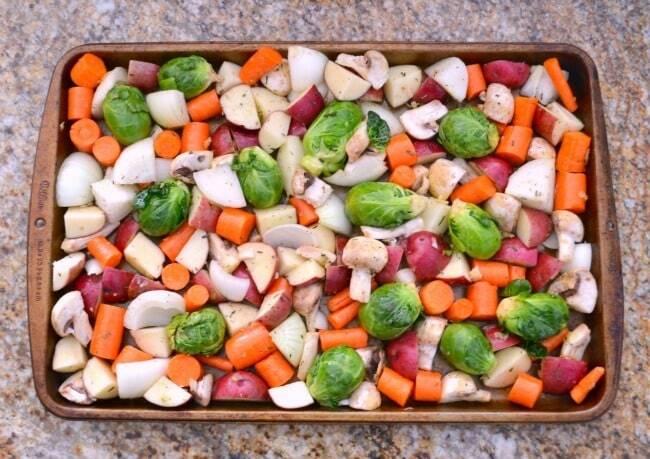 Arrange vegetables in a single layer on a large baking sheet. 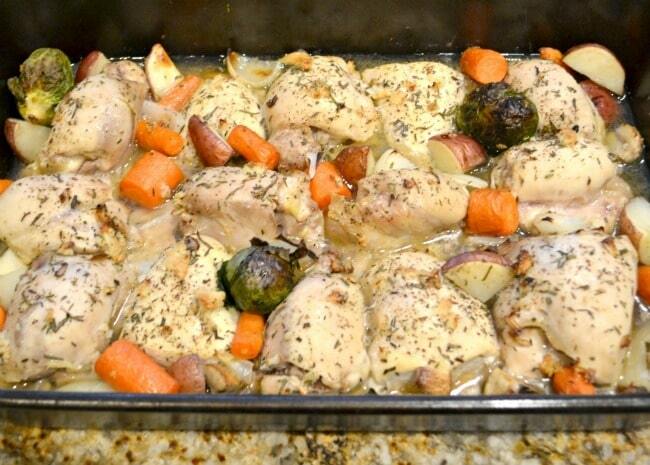 Bake chicken and vegetables at 400°F for 30 minutes or until lightly browned. If top rack browns faster, switch the baking sheet and roasting pan to allow both to brown evenly. I hope you love this recipe as much as I do! I promise, it smells and tastes as good as it looks. What a delicious chicken recipe! I’m going to try that. I love garlic, too. I always add more than recipes call for. Thanks for the great easy dinner ideas! I lo-ove garlic (there’s no such thing as too much garlic in my book) so I’m thrilled with your recipe and garlic peeler and press. Hmm…. all in one pan. Sounds easy and delish! Thanks for this idea.